Dimensions 0.50 by 7 by 8.25 in. Amazon.com description: Product Description: Creativity is more than an inborn talent; it is a hard-earned skill, and like any other skill, it improves with practice. Graphic Design Thinking: How to Define Problems, Get Ideas, and Create Form explores a variety of informal techniques ranging from quick, seat-of-the-pants approaches to more formal research methods for stimulating fresh thinking, and ultimately arriving at compelling and viable solutions. In the style with which author Ellen has come to been known hands-on, up-close approach to instructional design writing brainstorming techniques are grouped around the three basic phases of the design process: defining the problem, inventing ideas, and creating form. Creative research methods include focus groups, interviewing, brand mapping, and co-design. Each method is explained with a brief narrative text followed by a variety of visual demonstrations and case studies. Also included are discussions with leading professionals, including Art Chantry, Ivan Chermayeff, Jessica Helfand, Steven Heller, Abott Miller, Christoph Niemann, Paula Scher, and Martin Venezky, about how they get ideas and what they do when the well runs dry. 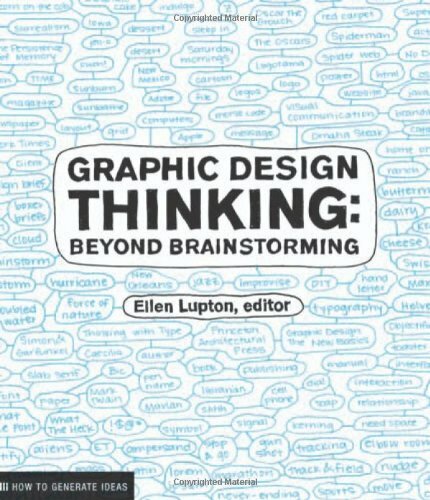 The book is directed at working designers, design students, and anyone who wants to apply inventive thought patterns to everyday creative challenges. About: Creativity is more than an inborn talent; it is a hard-earned skill, and like any other skill, it improves with practice.